23 European teams can start preparing in earnest for the qualification to the Men's World Championship 2019 as they got to know their opponents when the draw was conducted on Tuesday. 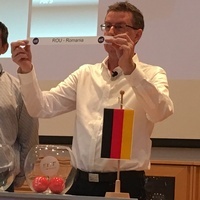 The draw was conducted by Markus Glaser, Chief Sports Officer of the European Handball Federation, and Bernd Rabenseifner, Secretary General of the Austrian Handball Federation. The qualifcation is played in five groups of four teams each and one group of three teams each. The winner of each group qualifies for the play-offs which will be played in June next year. The 23 teams having to play the first qualification phase have been drawn in the following groups. The qualification matches will be played over six rounds. Europe will be represented by 13 teams at the 24-nation Men's World Championship 2019 which will be played from 10 to 27 January 2019 in Germany and Denmark. France as defending champions as well as Germany and Denmark as hosts are already qualified. They will be joined by the champion of the Men's EHF EURO 2018 or the respective best ranked team in case France, Germany or Denmark win gold. Hence 12 of the following 13 teams are qualified for the play-offs: Austria, Belarus, Croatia, Czech Republic, Spain, Hungary, Iceland, FYR Macedonia, Montenegro, Norway, Slovenia, Serbia and Sweden. The play-offs from 8 to 10 and from 12 to 14 June will determine the final nine European participants for the Men's World Championship 2019.